Last Man Standing by BBC Online is a Macromedia Flash 5 game. It has a series of 4 increasingly difficult scenarios where England require x runs to win with the last pair at the wicket. You select various batting shots by using the numeric key pad. There is a 'Hints' option which will show you the length of the impending delivery and what ideal shot to play. Even with this option on the game is very hard. If anyone manages to beat the 4th scenario (without hints on!) please let me know. I have now had 3 people let me know they beat this challenge (only one mentioned they had turned hints off as I originally did not mention that bit). Ollie Williams said - Rising to the challenge of the 4th scenario with no hints, I have, after circa 6 hours gameplay, beaten it twice. The best performance of the two was achieving the runs in 12 deliveries due to some consistently leg-side bowling and a little luck. 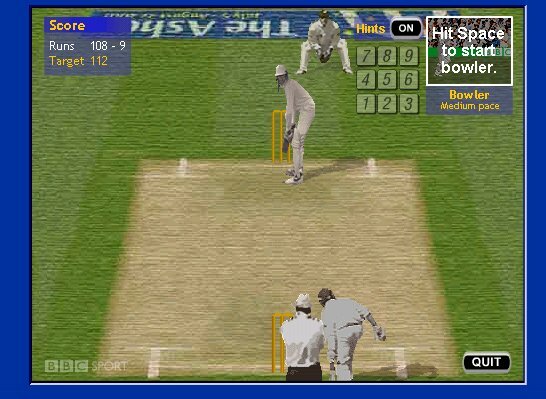 I have emailed the BBC and asked if there is any possibility we could play a whole innings (getting a respectable total would take years of gameplay), and they say their technical team is looking at it. Visit the Last Man Standing home page to play the game. Send feedback about Last Man Standing.